We started working on several wooden pallet furniture ideas due to various reasons, and one among them was to bring about a change. We just wanted to switch to some self designed wooden furniture items in contradiction to the same typical wooden objects. But the moment when we feel like enough of work has been done on the wooden furniture items, now we feel like bringing in some entirely new ideas using the same wood pallet. 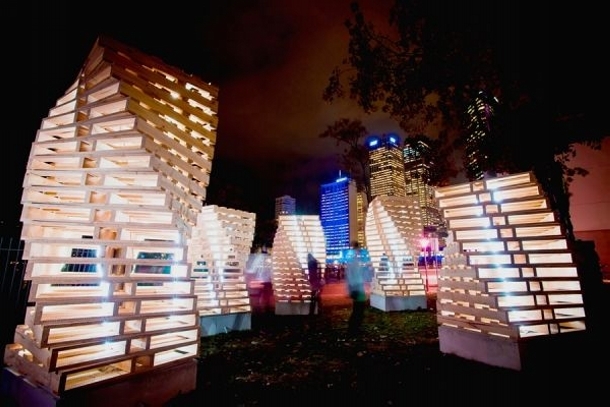 So this entire article would be consisting of some amazing wood pallet installations pretty away from stereotypes. A few installations that would be livelier. 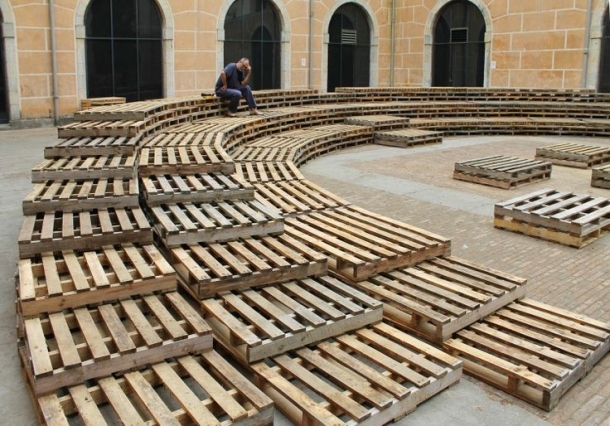 What do you perceive from this strange wooden pallet installation? Well, this is basically an Olympic installation made in the castle. What we did exactly, we just placed the pallets in a position of one on another in a twisting sequence, and we ended up making this incredible pallet wood installation. 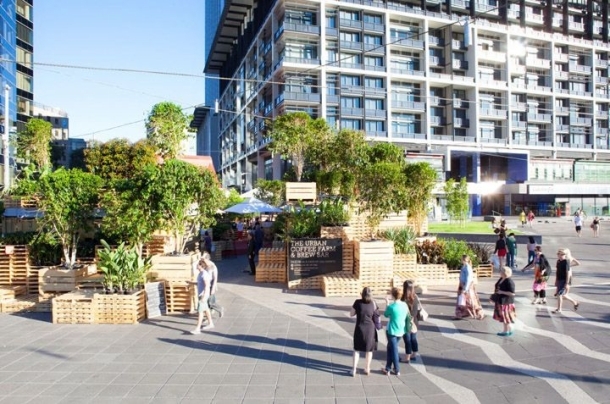 And what would you say about these pallet wood playround and outdoor rooms? Aren’t they simply gorgeous? They could be a best source of recreation and playing activities for the kids. These curved and twisted wooden bars are a source of attraction for the little fellows. This is again something that could be considered in the wood pallet extravaganza, this is a splendid wooden pallet architecture, more like a stadium all around a wooden pallet podium. This could be a perfect venue for some group discussions, or some indoor games. Whatsoever use is taken from this, the scene created over here is tremendous. If you start moving out of the ambit and jurisdiction of wooden pallet creations that are usually done, you can really come up with such astonishing wood pallet creations. 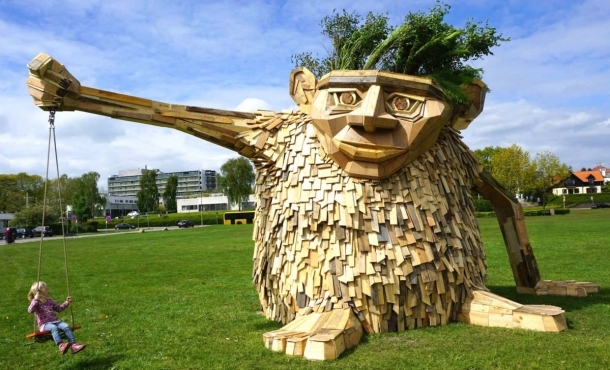 Just like this gigantic wood pallet caricature that would be a pleasant surprise for the visiting kids in the play ground. This one is although not a true shining star, but may be a best wooden pallet star that could be a welcome sign right in the front door of your house, showing your inclination towards the art crafts and wood pallet recycling. Are there some amateur skate board riders? If yes then they need to have a detailed look on this useful pallet wood creation. 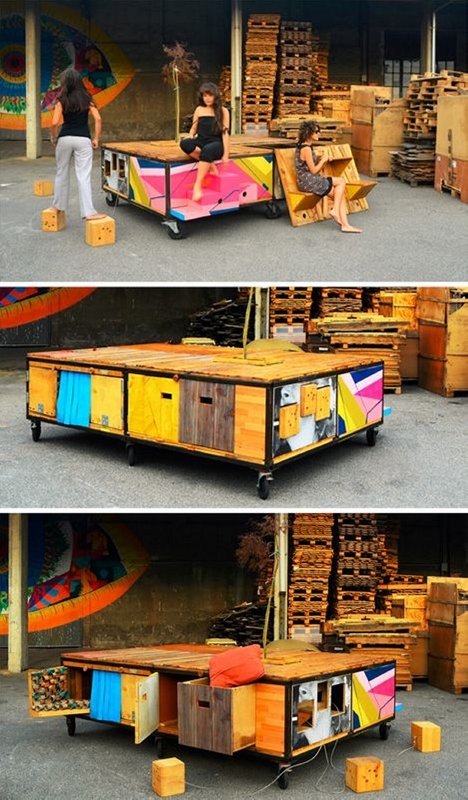 You don’t always need to go out, but you can set this skateboard stage right inside your place. 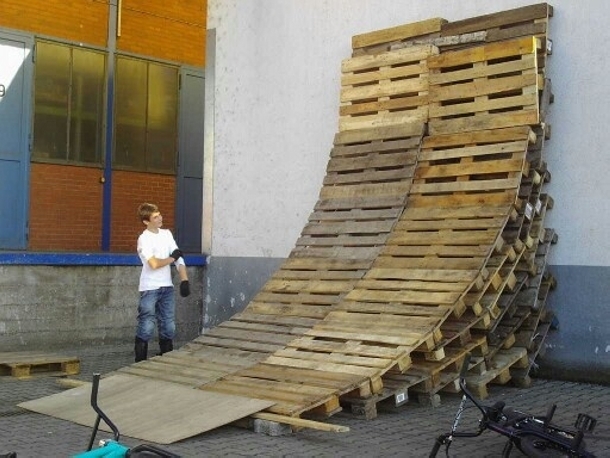 Mere straight shipping pallets are placed in certain manner that turned to be this skateboard ramp. 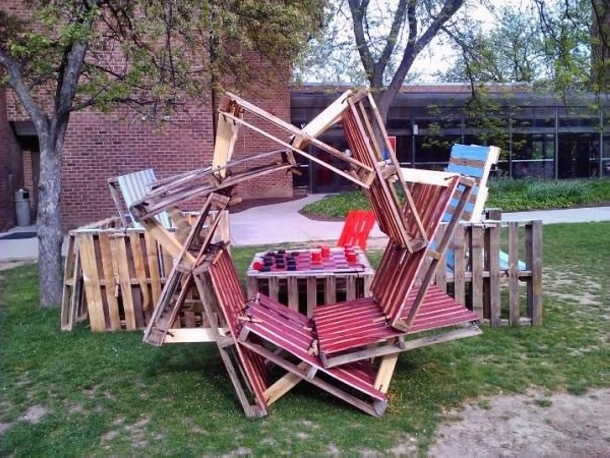 And how about this rustic wood pallet pavilion idea? 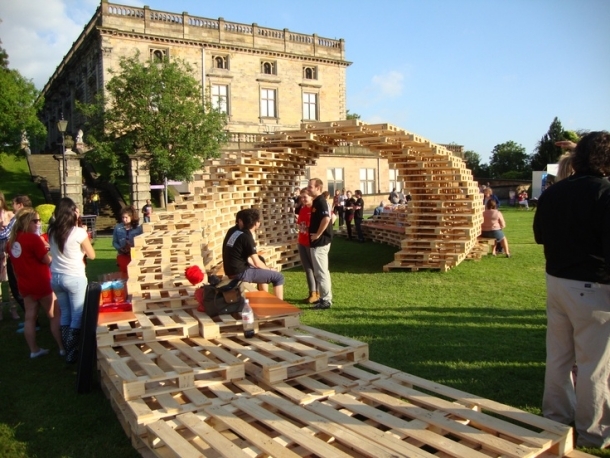 Larger piles of fresh wood pallets are piled up on the concrete stairs creating a proper pavilion set up. A number of spectators and audiences could be accommodated here. 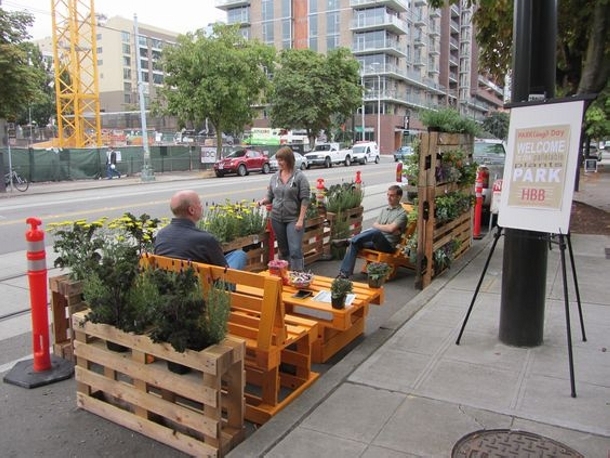 Another smart and cunning pallet wood installation for sure. 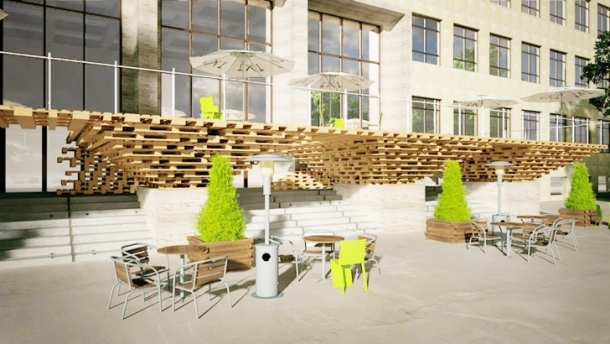 We have already worked on some commercial sites using the same wooden pallets. This is again some public view point, a beautiful lake where we can see a wooden fence all around the lake. And this rustic wooden fence is made again using the same pallet wood planks. 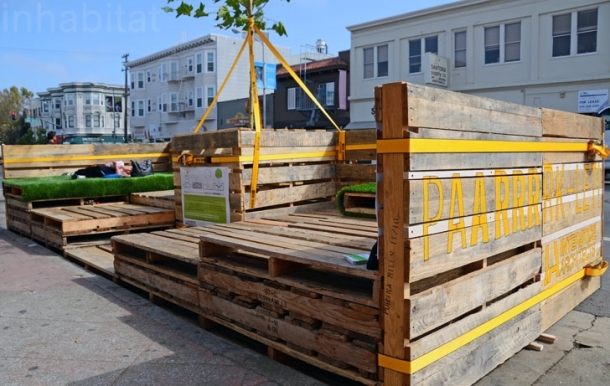 This pallet wood recycling has become so pretty famous in various countries that it has literally become an established industry. More and more people are getting involved in this business with every passing day. Like here we can see various huge wooden pallet planters displayed in an exhibition especially conducted for pallet wood creations. 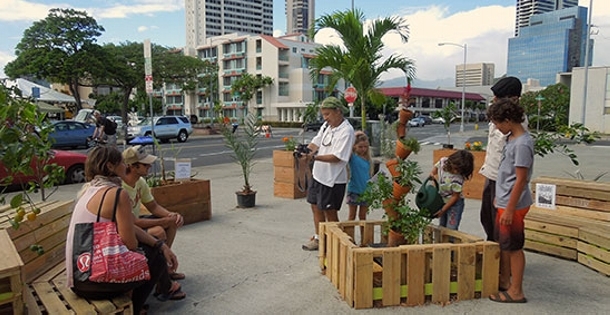 With repeated ideas of wood pallet recycling, we are just having a wave of appreciation and applauses from our regular surfers. 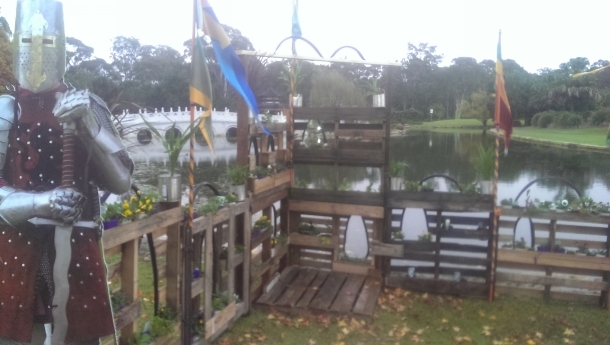 Here is another stunning wooden pallet creation. 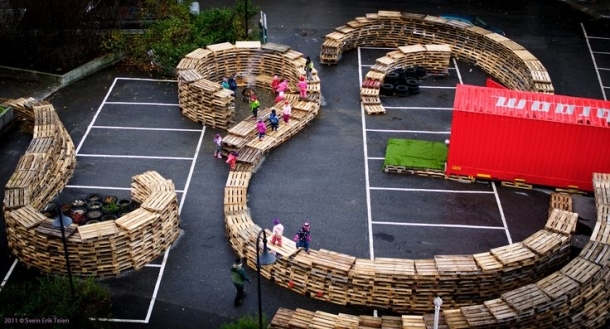 These are some gigantic wood pallet couches in a public park that is undoubtedly a creative initiative. This is again some public spot in some posh area of the tourist venue. We can see some of the most decent pallet wood installations here in the shape of wood pallet furniture items surrounded with plants. The beauty is simply matchless, and the skill that is employed in making these pallet creations are also worth all the appreciation and praises. And before getting done, we could not forget to do something good ultimately for the kids. This is a rough sketch of a domestic wood pallet recycled kids play area where they can enjoy all their favorite sports activities.